In 2007, University of Pennsylvania Professor J. Scott Armstrong challenged former U.S. Vice President Al Gore to a bet on what would happen to global average temperatures over the following 10 years. Armstrong’s challenge was in response to Gore’s warning of a looming dangerous “tipping point” in global mean temperatures. His proposal of a $10,000 bet was intended to draw attention to the need to assess the predictive validity of climate forecasts in an objective manner. Armstrong issued his challenge based on the knowledge that predictions of dangerous global warming were the product of methods that violated 72 of 89 forecasting principles relevant to the forecasting problem. Emails to Gore were unproductive: after several attempts at engagement, his staff informed Armstrong that Gore did not take bets. The important question of whether public policies should be based on the alarming projections remained, so Armstrong commissioned theclimatebet.com site to track how the bet would have turned out had Gore accepted. Gore’s warning was not directly testable: he failed to provide a quantitative forecast. 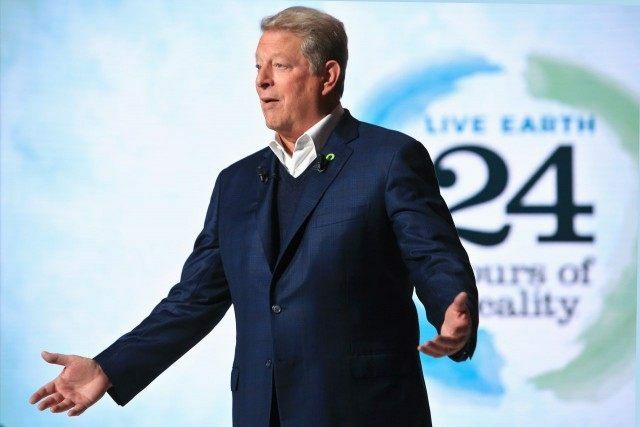 The 2001 U.N. Intergovernmental Panel on Climate Change (IPCC) Third Assessment Report’s “business as usual” projection of 3°C per-century was used to stand for Gore’s forecast. Adopting the IPCC projection favored Gore, as it was less extreme than his “tipping point” alarm. The bet was monitored monthly using satellite data on lower troposphere temperatures from researchers at the University of Alabama at Huntsville. In contrast to surface data, these satellite data cover the whole Earth, are fully disclosed, and are not contaminated by poor maintenance and location of weather stations, changes from mercury to electronic measurement, and unexplained adjustments. In calling for the rapid implementation of expensive policies, Gore was presumably highly confident about his alarming forecast. Armstrong was not: a simulation using 150 years of temperature data suggested that, due to natural variation in global temperatures, his chance of winning a bet for as short a period as ten years was only 70 percent. The most effective way to compare the accuracy of forecasts from different forecasting methods is the relative cumulative absolute error. By that measure (measure 1 in the table), the no-change forecast errors were 12 percent smaller than those of the IPCC dangerous warming projection. Seven other measures are provided to help readers draw their own conclusions as to whether, with the benefit of hindsight, it would have been better in 2007 to plan for a tipping point, or no change, over the next decade. * For detailed findings table and technical details see here. 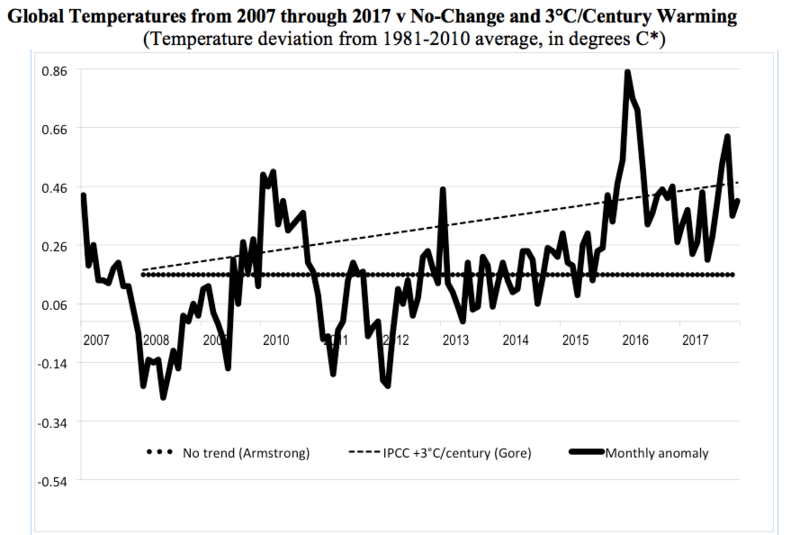 Longer is better for assessing climate forecasts, and so Armstrong has agreed to extend the bet for another ten years, sticking with the original 2007 global mean temperature as the starting point. This time he has reason to be more confident. Validation tests published two years after the original bet compared no-change model forecasts with IPCC dangerous warming forecasts for horizons from one to 100 years, and found that no-change forecasts were considerably more accurate; especially over longer horizons. That study, followed all of the relevant scientific forecasting principles, with only a minor exception. To our knowledge, the study remains the only peer-reviewed paper published in a scientific journal that provides scientific forecasts of long-term global mean temperatures. Kesten C. Green (kesten.green@unisa.edu.au) teaches managerial economics in the University of South Australia Business School.